The church of St Martin of Tours, Bilborough. NO question exists as to the meaning of the latter portion of the name of Bilborough; it is the Saxon "burh." a fortified place; but the derivation of its fore-part is not so clear. One supposition is that it comes from a British word "Bli," milk-producing—a theory which presupposes the existence then of ample meadows of which there is no evidence. A more daring origin advanced is that the Druids had here an altar dedicated to Baal, which they defended by a fort—hence "Baal-borough," but this is sheer imagination. Modern authorities agree that the true explanation is ''the fortified place of Billa," and there is a Bilbrough in Yorkshire for which this derivation is accepted. The Geological Survey (1908) states that "a small quarry on the south-east of the Nottingham road shows a very sandy red limestone which suggests the proximity of the ancient shoreline—a reminder of the time when the district was a waste of waters ere the Trent had formed its course." Of Billa nothing is known, and nothing definite can be said of the fortifications. Major A. E. Lawson Lowe considered it probable that they were thrown up by the Romans to protect their forest military road, now known as Coventry-lane, which intersects the parish, and this view appears to receive support from the recent discovery by Mr. Adrian Oswald of a large pear-shaped mound about a hundred yards east of the village on high ground ten yards north of that lane. At present however, it must be left to conjecture whether this earthwork was either British or Roman, though its proximity to Coventry-lane is suggestive. Small though the parish has ever been it had two manors at the time of the Norman invasion. Their Saxon owners were dispossessed and the manors formed into one and bestowed upon William Peverel. His united manor was of fourteen bovates—a bovate being as much land as an ox could plough in a year, but there was another bovate that did not so pass, for it was soc (or belonging) to the king's manor of Arnold. There were 8a. of meadow and a coppice, with nine families, of which two were of villiens who could not leave the manor, four of serfs who were little better than slaves, the other two being socmen or superior tenants who were almost freehoders. Peverel instituted one Ambrose as his representative, but on account of military ravages or for some other reason the parish declined in value from 30s. in 1066 to 20s. by 1087. 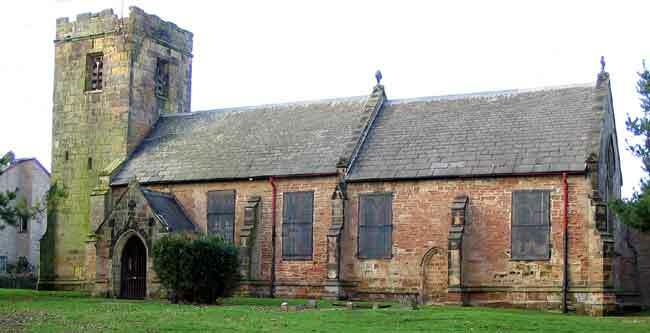 Ambrose was succeeded by his son Herbert de Bilburgh, who gave Lenton Priory a mark yearly out of his mill on the Leen. The monks of Lenton subsequently obtained one mark of silver yearly by the gift of Symon, son of Symon, son of William (such was the difficulty of describing individuals before surnames became general) out "of his mill at Bilborough, called Bobursmilne." Symon, son of William de Kyme, to whom the forfeited lordship was granted when the last of the Peverels fled in 1154 before the wrath of Henry II, quickly parcelled out land to tenants. Richard de Gaitune (or Gatton) and a man called Bernard each had two bovates, but it would seem that the parish was impoverished, for its Whitsuntide offering at Southwell each year was the minimum amount of sixpence, and until well into the 13th century successive lords of the manor were being excused payment of feudal dues to the Crown or were paying reduced amounts. The Pipe Rolls record that in 1164 the sheriff accounted for 3s. of the goods of Alan de Bilburgh who perished by the ordeal of water. When Hubert de Bilborough died without an heir male his inheritance here and elsewhere was divided between his two daughters. To Emma, the elder, fell Gonalston, Widmerpool and other possessions; she married Ivo de Heriz and their posterity were long the lords of Gonalston. Ivicia, the younger daughter, had Bilborough: she married one Aman, of Nottingham, and complications ensued. Symon de Kyme died in 1199 leaving three daughter coheiresses—Agnes, who married Walter de Fauconberge; Isobel, wife of Walter de Riboef, and Petronilla whose husband was Stephen the brother of Agnes's Walter de Fauconberge. Presently the widowed Petronilla passed her lands to the Riboefs, but in 1199 she paid a fine to have a hearing of her claim to lands in Bilborough and Cuckney, and for some years the old Kyme lands were the subject of claims and counterclaims. The two Fauconbergs sued the two Riboefs, and Robert Fitz Aman, as grandson of Ivicia, sued the Riboefs who called upon Symon de Kyme to make good his warranty; each produced a charter in his own favour and although Fitz Aman won the verdict it is probable that the matter was settled by agreement, for the Fitz Amans are heard of no more whereas the Riboefs continued in possession under Simon de Kyme whose descendants held a knight's fee here in 1283. In 1235 Richard de Riboef was Bilborough's manorial lord, but seven years later Robert le Vavasour was holding half a fee here. It has been suggested that he was holding it as guardian of the Riboef heir, but in any case he made it his own, and in 1242 he was taxed for it at 20s. for the French war. In that year he was granted licence to hunt smaller game in his own demesne. Eight years later, when the value of the manor was returned at 6s., he was paying 20d. yearly to the sheriff in respect of his manorial rights, and 3s. to the sheriff's aid. In 1264 Robert and, Richard Riboef were in the garrison at Nottingham Castle when it was held on behalf of the barons against the king, and it is unlikely that when the king triumphed in 1265 they would escape retribution; they would probably be pardoned upon payment of a heavy fine. Robert de Strelley, who died in or before 1302, had taken to wife the heiress daughter of William le Vavasour, and in her right he became possessed of the manor and the advowson of the parish church. The manor-house then stood within a little park with its dovecote and fishpond amid 130a. of private demesne. Four free tenants each paid 12d. a year for the single bovate he occupied; eight customary tenants, each holding two bovates, rendered 5s., and six cottars paid 18d. apiece for their cottage, but they were fortunate in escaping boon work (forced labour for their lord). At the time of his death this Robert, with the prior of Lenton and Adam Daft shared between them half a knight's fee in the parish, and from that time the adjoining lordships of Strelly and Bilborough descended as one estate. As compensation for rights surrendered elsewhere, Queen Eleanor was in 1283 made overlord of half a knight's fee in Bilborough held by Philip de Kyme, with all its perquisites of wards escheats, marriages and other feudal rights. This change would not materially affect the villagers, and it ceased in 1290 when this beloved wife of Edward I died at Harby in this county. After this the Kymes faded out of Bilborough's history, but members of the family were resident in the shire for many generations and a Philip Kyme was buried in St. Mary's Church at Nottingham in 1619. One of Mr F. Hind's archaeological discoveries is that of a rectangular earthwork in a field north of the church, and in the Transactions of the Thoroton Society for 1939 Mr. Adrian Oswald records the results of his trial diggings and adds a sketch-plan to his account: The enclosure is about 150ft. E. to W. and 120ft. N. to S. The outer court was surrounded by an earthen rampart, now 2ft. above the natural level of the soil, upon which there was probably a wall or stockade, and in the N.E. angle an inner enclosure of masonry guarded "a small semi-fortified building.'' Dr. Oswald suggests, on the evidence of pottery found, that it may have been of 14th century construction, but he is careful to remark that certainty is impossible until the site has been excavated. Assuming the correctness of his date-conjecture this would be a home of the Strelley owners. In 1316 "Strelleye and Bylburgh" together were officially regarded as one whole 'vill' and Robert de Strelley was the lord thereof. Before 1346 Newstead Priory had obtained property here, as also had Adam Daft, but by that time the Daft interest had lapsed and the priory appears to have made an exchange as Robert then had its old land and the priory held in another part of the parish. This Robert Strelley died four years later, when the Black Death was ravaging, and Constance, his widow, took the vow of chastity and became a vowess dedicated to widowhood for the rest of her life. The village appears to have been unaffected bv the War of the Roses, but in 1458, when that long strife was nearing its close, the parish was enlarged in an unusual way, for Broxtowe, which hitherto had been a separate parish, had become so depopulated that it was united with Bilborough, a union which endured until our own time. As the "Pilgrim Path" from Nottingham to Dale Abbey passed by Bilborough one of the familiar sights in the village would be that of persons religiously wending their way to and from the monastery, to which the earliest Strelley owner here had been a benefactor. The last of the pre-Reformation rectors of this parish was also master of its mediaeval school. His name was John Smythe; he received boarders, and a lawsuit of 1505 shows that his fee for tuition and board was ninepence a week. He was then suing Thomas Samon, a leading inhabitant of Nottingham, for 9s. as a quarter's charge in respect of a relative, but lost the case, having, perhaps, sued the wrong person. Eight years subsequently, when Dame Agnes Mellers founded the Free Grammar School in Nottingham, this Thomas Smythe was appointed as its first master.